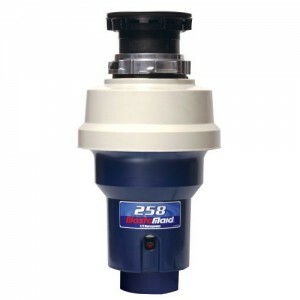 The Waste Maid WM-258 Mid Duty Garbage Disposal is a ½ HP high grade disposal at an affordable price point. Waste Maid disposers bring a lot of features at a lower price without sacrificing overall quality in operation or durability. The WM-258 uses higher grade materials than Economy and Standard models, and is suitable for higher traffic use. The WM-258 incorporates a Speed master Mounting System for quick, easy installation and replacement of old models. With the attached power cord, the WM-258 operates on you standard 120V household line voltage. The WM-258 comes with a lifetime corrosion guarantee, and a 5-year Manufacturer warranty. Operates at 120V / 375 Watts. Waste Maid Garbage Disposals use Bio Shield technology, which is incorporated in all mechanical plastic parts that come in contact with food particles. The Bio Shield anti-microbial design eliminates the build-up of bacteria and germs, causing odor and potential malfunction. The removable splash guard (included) keep unwanted objects from entering the unit unexpectedly.